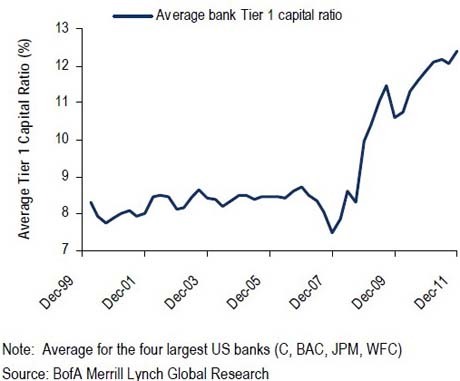 Four of the largest U.S. banks have increased their Tier 1 Capital by more than 50% capital since their pre-crash levels. They and others are now undergoing a Fed mandated stress test for which the criteria are an 8% decline in GDP, 13% unemployment and a 21% further drop in house prices. This chart is from a recent Bank of America research report. This entry was posted on Tuesday, March 13th, 2012 at 11:43 AM and is filed under Interesting Charts. You can follow any responses to this entry through the RSS 2.0 feed. Both comments and pings are currently closed.